Here at Teespring we are committed to not only providing a platform for creators to launch and sell creative merch to their communities, but we also have a HUGE passion for the creative process involved in developing and conceptualizing creative branding and merchandise. Our in-house experts are here to provide top class resources and support, check out our design support services below. You have an entire community behind you and although you might not think it, you have built yourself up to be a brand – a brand people love! Make sure to incorporate your channel branding, logo, color scheme and general personality into your merch and storefront! Consistency shows you mean business! At Teespring, we’re passionate about quality design. We believe that although an idea can be strong, it’s the execution that ultimately determines success. Keep in mind that designs don’t need to be complex or complicated — some of the most successful designs are minimal or simplistic in style. It’s all about your community! Create merch your community will love and want to wear with pride – remember, they are representing you and your channel. A logo design works well to unite your fans and is good to have available as a staple in your store, but be sure to think about what resonates with your audience that dives deeper into your channel. The most successful merchandise is designed around great content, current events, trends, slogans and inside jokes your community loves. Do you have a catchphrase that your fans can’t get enough of? Was there a fan comment that really stood out? ShadyPenguinn’s “It’s a crit!” design is a great example of converting community lingo into a top-selling design. ShadyPenguinn uses this phrase every time a “critical hit” happens while playing Pokémon. “It’s a crit!” is a phrase that his followers (and others in the gaming community) can identify with. Also, don’t forget to release merch for calendar moments like Halloween, Christmas and Valentines Day – you can get really creative around these moments and add your own twist to relate back to your channel. Check out how Phil DeFranco’s team got creative for the holiday season! Remember, you are making merch for your community! – Dive into your comments and discover the bits of content that resonate most with your fans and create merch around those themes. Check out this video from the YouTube Creator Academy which explains this further. In parallel to this, we would highly recommend engaging with fans and finding out directly what they would like to see on merch. Create a request video, set up a YouTube live brainstorm session, post a Twitter poll, or ask your followers to slide into the DM’s and involve them in the design process. You can run free, easy-to-build surveys through SurveyMonkey that can drive amazing insights about who your fans are, what they like about you, and what it is about you and your content that resonates with them. If you’re still not convinced check out this blog post for more inspiration. Remember: a simple idea like a funny saying or slogan can be live and selling in minutes! Strike while the iron is hot! Our head of merch design over here at Teespring, Jared Fowler, has kindly shared with us his Pinterest board, which houses an ever-growing collection of different design styles and pieces of inspiration to get your creative juices flowing. 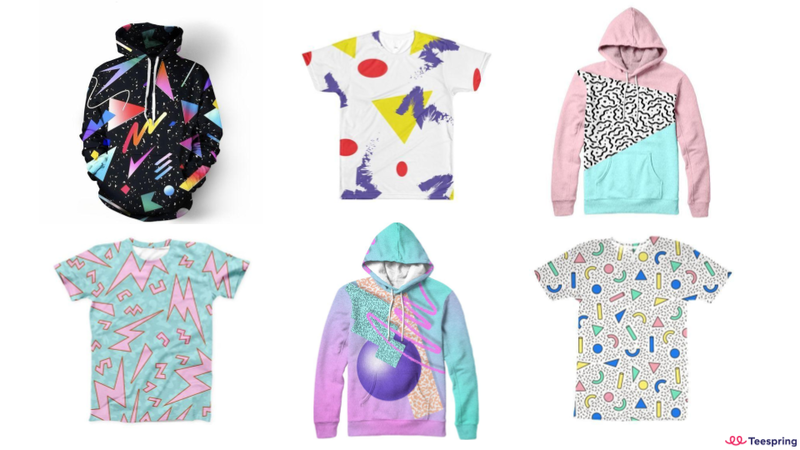 Did you know that all-over printed apparel is one of the hottest fashion pieces right now, and huge in the merch world! – Luckily for you, we have just released high-quality all-over print tees and hoodies. Now that you have an idea for your merch design, it’s time to bring it to life! The number one thing fans look for when buying merch, is the quality of the design. Yep, that’s right – it’s very important to make sure your fans dig the artwork – but don’t let that put you off, it’s super easy to create or source a cool design in no time at all! Hot Tip: It’s ok to keep things simple! Slogan and type-based designs are all the rage at the moment – check out this board for more inspo. If you need to get up and running quickly and don’t have design software, then we highly recommend using an online design generator like Canva or the Place-It T-Shirt Designer, to create simple, clean designs using their easy-to-use online platforms! You can have your idea turned into a print-ready file in no time! 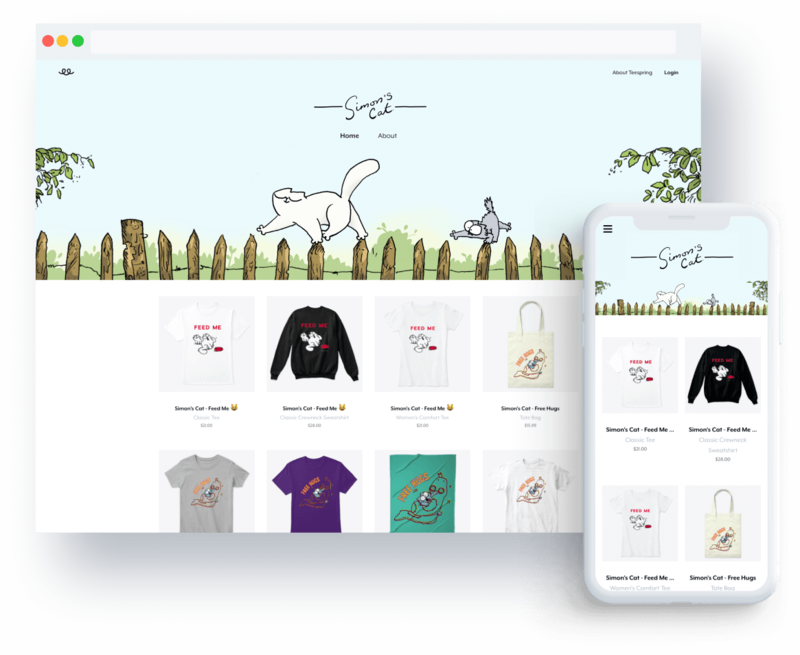 Be sure to check out our own design tips and best practices to ensure your file is setup correctly and ready to upload onto the Teespring design launcher. Make sure you use high-quality artwork (300dpi) when uploading. So you’ve got an idea, but you don’t feel like you have the time or skill to turn it into a reality… not to worry – there are a range of sites like Upwork, 99designs and Peopleperhour, which host a huge database of freelance designers. You can check out their portfolios and filter them by price and experience, to find the perfect designer for you. We also have handpicked and vetted a talented group of designers that we highly recommend working with. Check out our Teespring Trusted Designers HERE. They have been picked based on their experience working with creators and producing high quality artwork specifically made for merch. We offer three levels of design support depending on the size of your channel. Please see below the three service tiers. Send through your request and a member of our support team will be in touch within 24 hours.